When in doubt, get to your veterinarian for a thorough examination and blood pressure check (My general advice is call first to see if your veterinary clinic can check a blood pressure with a Doppler machine like this one below; if they can’t and don’t have a blood pressure monitor in their clinic, find a new veterinarian!). Once your cat checks out ok, and it turns out to be cognitive dysfunction (or senility), I’d recommend a holistic supplement that you can safely purchase online or from your veterinarian. When in doubt, you can also consult with a board-certified veterinary behaviorist; find one in your area here! I just started using Senilife in my own cat after recommendation from a veterinary behaviorist. 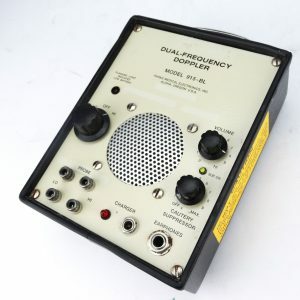 Honestly, I love this product (and I have nothing to disclose – I have no association with this product at all). I’ve only used it for 4 days in a row so far, and it’s worked really well. My cat, who howls and screams every single night, hasn’t screamed at all except for the one night that I also forgot to give him his nightly pain medication, gabapentin. Couldn’t be happier – I simply cut the end of the red capsule off, squeeze the brown liquid thick contents into a cat bowl, add 1 tsp of a prescription cat food that is really palatable (You can get this from your veterinarian – I use Purina Critical Nutrition diet). If you have a small dog (< 50 pounds), you can use Ceva Senilife for Small Dogs (up to 50 pounds) . Phosphatidylserine, which improves nerve-cell communication and helps this process continue working effectively. Again, I just started using this in my own cat, so I’ll keep you posted in a few months if it’s helping or not! Hope it helps and please share below if you’ve had positive or negative responses in your dog or cat! My 19 year old Siamese does all the things your cat does and she was just put on hyperthyroid medication but she’s still noisy. 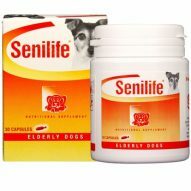 My vet recommended the Senilife but it says it’s for dogs so I haven’t bought it yet. Also she weighs less than 5 lbs so I wouldn’t know how to figure out how much. Since you say you give it to your cat I figure it’s ok for cats even though it only says it’s for dogs. Would you have a suggestion for dosage for a 4.2 lb cat, hopefully she’s gained a little back but I’ don’t think much yet. I would ask my vet but when she suggested it she said follow the directions on the label, which won’t help when they are giving you dosages for dogs who weigh a whole lot more than my cat. Congrats on having a 19 year old cat! 🙂 You can use the SMALL DOG dose of Senelife for your cat – it’s very safe and benign. If you’re worrie,d you can give HALF of the capsule on food (if she’ll eat it that way) and see if that dose helps once a day. Again, use the small dog capsules! Thanks, I appreciate your help, I couldn’t find anyone to help not even the company! I hope it works as well for my cat as yours and I hope both our cats make it into their 20’s! Sorry I forgot to ask, is the small dog product the one that says for elderly dogs like you show in the picture? Thought I should be sure since it doesn’t say for small dogs like the other version that say for large dogs over 50 lbs. Yes, like the one in the picture. I’ve added a link to the blog above! Sadly, my cat that I was using this on died of squamous cell carcinoma (oral mouth cancer). It did work well in conjection (with gabapentin for osteoarthritis). Are there any known side effects? My 13 year old lab mix is having cognitive issues, so I put her on this about 2 weeks ago. Last night she started walking like a drunken sailor and shaking her head. I’m very concerned and can’t find anything online about side effects. This is really the only new thing we’ve done with her recently. Thanks. Can I increase the dosage of Senelife safely for my 14 year old Beagle? She’s done well on it once a day, up until about 10 days ago. She’s recently started showing some further cognitive deterioration. Want to give her a second dose of the Senelife in the evening, to see if I can see any improvement again. So sad. She’s eating, walking and mostly sleeping ok (a bit restless). She’s just not really “here” anymore. She does still like other dogs and will get sorta playful with them but at home…she just stopped running around the house with her toy after dinner, like a maniac…. Sorry to hear that – I would consult with your veterinarian in case something else is going on! While Senelife is safe, we want to make sure it’s not something medical going on. If I am reading the dosing directions right, my dog can digest the entire capsule, correct? Depending on the size of your dogs, yes. But when in doubt check with your vet. I have a senior yorkie who is just under 8 lbs. I’m wondering if this is a pill that can be cut, or if there is a smaller dose? The smallest dog size is a capsule and can’t be easily cut or split. But I have had good experience using the whole capsule for my cat. I’ve been giving Senelife (small dog size) to my 19 1/2 year old cat for the past year and all of his Dementia symptoms are gone! He still weighs 14 pounds and runs around like a kitten dispose having Kidney Disease, High blood pressure and Some Arthritis (all of which I treat with Meds, supplements and fluids) my vet is now recommending for some of her dog and cat patients with Dementia symptoms. I do poke a tiny hole in the red capsule and put it in a size 1 gel capsule (kosher/vegan) and use a pill gu. To administer to my cat. It’s super easy to do it this way because he hates the taste it I put it on his food and too big in its original capsule to pop down his throat. I highly recommend Senelife. It’s saved my cats life! And hopefully he has another year or two! Because he was SO active after a full dose (walking all over the house constantly for hours) I was afraid to give him a full dose this morning. But if it is OK for a small cat, then perhaps it is OK for my dog. Not sure what I will do, but gave a half dose today and he is sleeping alot. Maybe the full dose yesterday and all that exercise wore him out. I have some confusion about this pill .is it still good one for under 9 Ib puppy?